Stack’s Bowers Galleries (StacksBowers.com) will auction a 2000-P Sacagawea dollar / Washington quarter mule error during the upcoming Whitman Coin and Collectibles Expo in Baltimore. The rarity is just one of the seventeen known to exist. The error coin exhibits golden tan surfaces with areas of richer honey color. The pristine surfaces are complemented by satiny, cartwheel luster and bold definition to the design elements. Die striations at the border are as seen on all known examples, creating a spectacular sunburst effect that is most dramatic on the obverse. "This blunder is among the greatest Mint errors of modern numismatics and has captured the imagination of collectors and roll hunters for two decades," the company said. The creation of such a coin would seem impossible considering the rigorous standards of the modern U.S. Mint. However, a "perfect storm" of circumstances allowed for this incredible issue to emerge. According to leading error coin expert Fred Weinberg, around 1998 or 1999, the Mint instituted an Occupational Safety and Health Administration rule requiring employees in specific roles be rotated into other positions on a periodic basis, adding to the potential for confusion in the Die Room. 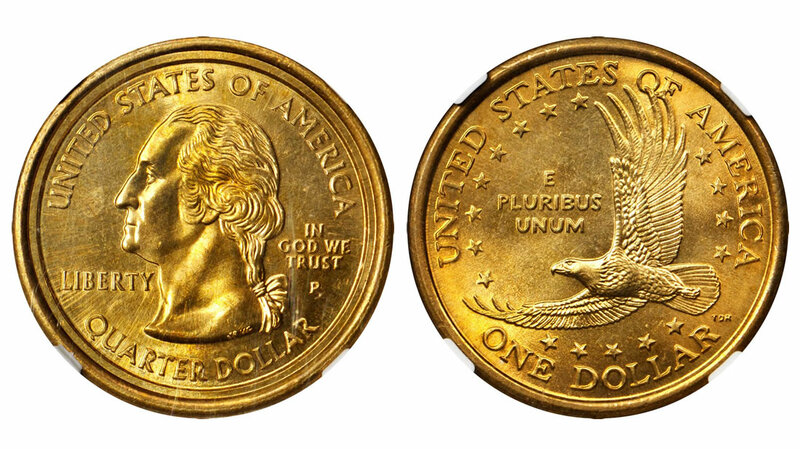 Sometime in spring 2000, a coin press operator requested an obverse die for the new Sacagawea dollar from the Die Room and was given instead an obverse die for a quarter. Many thousands of these errors were struck before Mint employees noticed the mistake, but once discovered, employees culled out and destroyed all the muled coins they could. Or so they thought. A few examples escaped and in late May 2000 the first was found in a roll of new Sacagawea dollars by Frank Wallis in Arkansas. While initially there was some debate as to the authenticity of the error, as well as the legality of owning the coins, the Mint acknowledged the error as genuine on June 19. Bowers and Merena sold that rare discovery piece at the August 2000 American Numismatic Association Millennium Sale for $29,900, a shocking price, as this mule was virtually unknown at the time. It has been reported that examples were sold privately in the neighborhood of $250,000 in 2007/2008, and one piece sold for 158,625 in the Stack’s Bowers Galleries August 2012 Philadelphia ANA sale. Today, these 2000-P Sacagawea dollar / Washington quarter mules are highly prized by collectors for their dramatic appearance and rarity. Error enthusiast Tommy Bollock owns 12 of the 16 previously known specimens. The present offering in Stack’s Bowers Galleries’ Official Auction of the Whitman Coins & Collectibles March 2018 Expo represents a new discovery and a new opportunity for collectors to acquire this trophy. This error will be sold alongside such spectacular highlights as a Specimen-66 (NGC) 1860-O Liberty Seated half dollar and the magnificent Proof-63 Cameo (PCGS) 1879 Quintuple Stella from the Garrett Collection. Contact the firm at 1-800-458-4646 or email Info@StacksBowers.com to secure your copy of this catalog. Holly smokes, who would have ever thought such a modern coin / error coin / would fetch such a high price. Check your modern rolls folks / you may be able to find a piece of retirement savings the size of a small coin. Apparently, lightning sometimes DOES strike twice, and in your case, in a GOOD way! Very amusing, Old Collector. “Teller, can you tell me where you got those 1944 steel cents from, along with the 1974-D aluminum cent that you handed to me just the other day?” And so, that’s the way it is as Walter Cronkite would end his evening broadcast years ago. Imagine the uncounted glorious pieces of numismatic history that have passed through the hands of bank personnel over the decades…and that they were too busy, distracted or unaware to even notice or care about! In 2005 I found out the new buffalo nickle came out and it had a mistake They called it a speared buffalo. I said to myself I have to buy one so I got on eBay and found one not graded I Purchased it for $67 and stuck in my dresser for 2 years and then decided to get it graded by Pcgs . This was my first coin ever to get graded. The coin came back a MS67 when I checked the PCGS web site come to find out it was the single and finest know. I sold it 2 years later for $15,000 and as of today it is still the single and finest know. And as of today I still have the bug for coin collecting. You either hit the Lottery or found the Holy Grail, but regardless that is both a once in a lifetime and a once in a million experience. Good for you to have experienced that clearly unexpected fortune! I was a teller for a couple of years, then moved on to train the tellers, and retired in December. Best find I ever had at the window was about 12 Kennedy halves, one ’64, and the rest 40% silver. The only thing that drew my attention was the fact that someone would bring in that many halves. Even 20 years ago it wasn’t very common. A bit off topic, but I had a few customers who, when cashing large checks, would ask me if I had anything larger than a hundred. I had to resist the temptation to go into the history of the large denominations. There’s obviously a lot to be said for being in the right place at the right time…and knowing that! John – great find and buy. You definitely made your money back…but I am sure a piece of you misses the coin. Reminds me of that German movie that served as the breakthrough starring vehicle for the somewhat quirky (also German) actress Franka Potente, “Run Lola Run”. Talk about frenetic! I assume you derived your posting name from the German word (minus the umlaut, apparently) for coins. Richtig? Ja, du hast recht. Leider spricht ich’s nicht fließend, aber gut genug. Und zu erklären, viele Webseiten kommen mit Umlauten nicht gut zurecht. I spoke German – actually and more specifically, the Wiener Dialekt (known there as “Wernerisch”) of Deutsch – exclusively until I enrolled at the American Army School in Occupied Vienna in 1953. After that I rather quickly began to transition to being bilingual, and so by the time I arrived in the U.S. in 1965 I was absolutely fluent in English. While I was indeed able to take graduate German courses in college as a freshman and sophomore, since that time long ago my ease of speaking and writing German – but not that of understanding it – has slowly but surely eroded. I’m afraid to say that now, 54 years after first arriving in America, my knowledge of the German language has basically disintegrated, and I am at home in English only. I know we’re going WAY off-topic here, but thank you for the fascinating information! German is actually my third language. My parents put me into a “baby” French class when I was about 5. Something clicked and I kept studying up through college, to the point where I was dreaming in that language. I was actually a math and physics major; at that time a lot of articles weren’t available in English so I signed up for introductory German and eventually made my way to a class in scientific translation. Unfortunately learning how to translate math papers doesn’t help much with conversational fluency, which has left me able to read fairly well but only able to fumble my way through speaking. Sadly, like you, speaking English for everything except occasional travel has put a thick coating of rust on the other two languages. I am quite frankly astonished that German is indeed your THIRD language. I have to tell you this both with a little bit of shame but not at all disingenuously: from your (first) post above I have to say that your written German is at this point far superior to mine. Ach du lieber! You clearly have an amazing aptitude for languages, and certainly one at least a level above mine. I can make out bits of Spanish, Russian, Dutch and French, but that is only from hearing them; I absolutely cannot speak any of the aforementioned languages spontaneously, that is, of my own accord. Schade, das. It seems to be a genetic thing for me. My dad was from an immigrant family, grew up bilingual and could navigate in a third. Both of my kids have studied and/or worked abroad, functioning almost 100% in those countries’ languages. Of course that wouldn’t be anything special for many people outside of the US, haha! I’ve always felt a bit conflicted about living in what’s mostly a monolingual country. We have huge advantages in being able to travel over much of North America and communicate with each other in a common language. On the other hand it think we miss a lot culturally by not having what I call “a window on the soul” that’s opened by knowing more than one language.